Hey! Hope you’ve all had a lovely Valentine’s weekend with loads of love and gift opportunities. Speaking of opportunities, late last year I had a wonderful opportunity to collaborate with a brand I first read about in a magazine. Now, what instantly got me interested were the words organic and fair trade, hmmm..sounds ‘sustainable’ I thought. I must tell you that I am passionate about the sustainability theme whether it is the environment or fashion. Sustainable fashion refers to creating products after considering their impact on the environment and society through their lifespan. Also I am a firm believer in the ‘less is more’ tagline and each day I feel more and more determined to be conscious of consumption and efficient use. ‘No Nasties’ is a 100% organic, fair trade clothing brand. 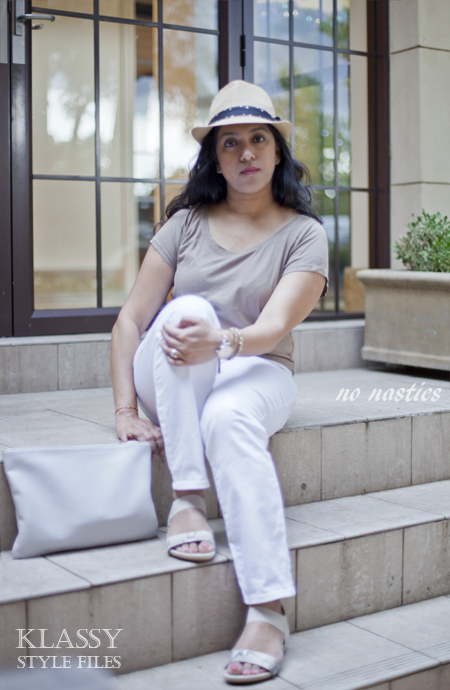 The No Nasties tee is organic in every step of its creation. From growing the cotton using no toxic pesticides, no genetically modified seeds, no carcinogenic chemicals to no child labour, no exploitation and no discrimination in creating the fabric, using natural dyes and converting it into a hand printed exclusive t-shirt! Essentially what you get is a well designed, well fitted tee at a great price point that also makes a positive impact to the world we live in. Sounds like a complete win-win to me! The styling ideas as you can see are quite simple really. 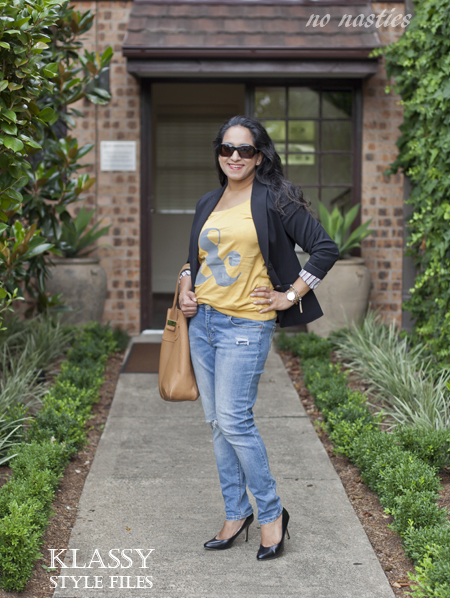 For the ‘&’ statement tee I thought it worked well teamed with the distressed denim and a blazer for added polish or alternated with the hat for a more relaxed chic look! 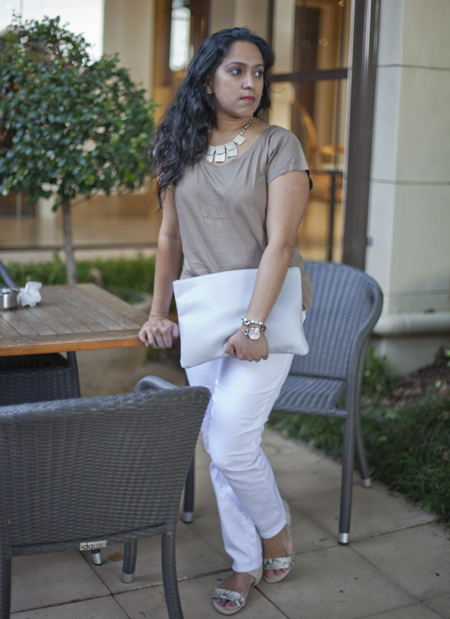 The mocha tee on the other hand is a wonderful neutral piece and I paired it up with other neutrals. 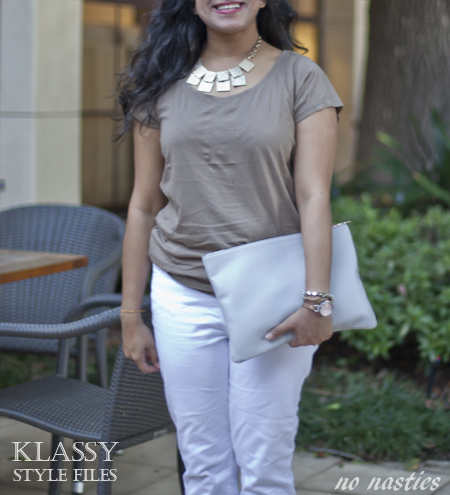 Adding a statement necklace makes it an effortless transition from a day to night look! Love the idea of making a difference and supporting ‘sustainable fashion’ ? Then be sure to visit No Nasties here, I can guarantee you will become a fan too! Note- This is a collaboration post. No Nasties offered me the t-shirts at a discounted price for writing this review. The opinions expressed in this post are independent and based on my own experience of the products. Great post. Nice outfit options. Many thanks Namrata, glad you liked the outfits!